Were Deere & Company's Results Good Enough? The agricultural machinery company reported better-than-expected results, but what about its underlying trends? Deere & Company's (NYSE:DE) recent results were warmly received by a stock market that's hoping the company can engineer a turnaround in fiscal year 2016. However, the earnings beat was more about cost cutting than any improvement in the agriculture machinery market. In reality, Deere still faces declining end markets in 2016. On a brighter note, the stock gives you upside exposure to any increase in crop prices, and for that reason alone it's attractive within a balanced portfolio. Let's look at what you need to know before buying or selling a position. It's hard to get too excited about a company that just reported a 25% drop in fourth-quarter net sales and a 20% fall in full-year 2015 sales compared with the same periods last year. On the other hand, the nearly 39% decline in attributable net income was better than expected. In the third quarter, management had reduced its full-year attributable net income forecast to $1.8 billion from $1.9 billion previously. The good news is, the figure came in at $1.94 billion -- a substantial beat. However, don't get too excited, because the better-than-expected net-income figure was largely to do with a more favorable effective tax rate -- 14% in the fourth quarter, where management previously forecast 34%-36% for the rest of the year. Moreover, selling, general, and administrative expenses declined 13% in the fourth quarter, where management had previously forecast an 11% drop -- the difference is around $50 million. First-quarter net sales to decline 11%. Full-year net sales to decline 7%. Full-year net income of $1.4 billion implies a 28% reduction from the full 2015. In short, it's going to get worse before it gets better, and the results were merely a case of conditions that weren't quite as bad as feared in the fourth quarter. Deere's earnings and cash flow could be set to trough in 2016 at a much higher level than in the previous recession. The stock has potential for upside surprise from an increase in crop prices, often caused by factors such as weather and conflict. In support of the first point, Deere's forecast for $2.6 billion in cash flow from operations represents a significant improvement on the $1.4 billion achieved in the previous trough in 2009. Moreover, unless we have another global financial recession, it's unlikely that farmers will have the same difficulty obtaining credit as they did in 2009. SOURCE: DEERE & COMPANY PRESENTATIONS. On current trends, conditions aren't getting any better, but investors need to recall that growing conditions have been exceptional in the past few years -- there is no guarantee that they'll be the same next year. 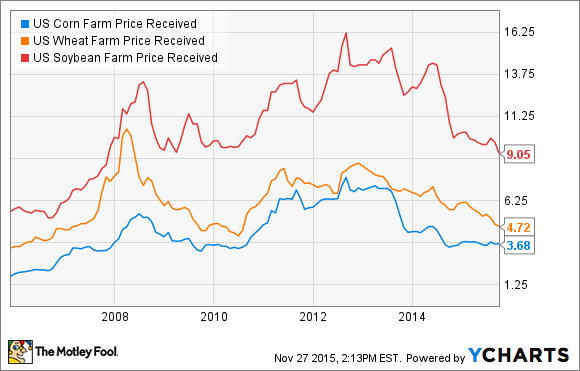 In other words, Deere could see upside from any positive surprise in crop prices. That said, risk is rising with the stock. The chart below shows Deere's current inventory divided by the next quarter's sales.The ratio has gone higher throughout 2015 when compared with previous years -- an indication that Deere is having difficulty clearing inventory. In addition, Deere's equipment on operating leases has significantly increased in the past few years, even while sales have deteriorated. This situation has created a scenario whereby a glut of used equipment could build up and put pressure on used and new machinery prices. Deere's results were better than expected, and the company has upside potential from the possibility of higher crop prices. Moreover, the company's projected earnings and cash flow in 2016 compare favorably with the previous trough. On the other hand, Deere could have issues with inventory and equipment prices in 2016. As attractive as the stock is, I think if you want to make a play on higher crop prices, then it's better to make a direct investment through an ETF or similar rather than buy Deere stock right now.